This is plate 28 of Robert Melville Grindlay's 'Scenery, Costumes and Architecture chiefly on the Western Side of India". 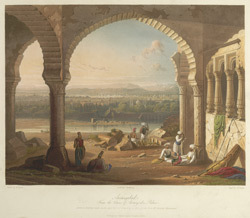 Grindlay (1786-1877) was in the service of the East India Company and also worked as an artist. During his stay in India, Grindlay made a large collection of sketches and drawings. This plate shows a distant view of Aurangabad, which was the centre of local government and the headquarters for the troops of the Nizam of Hyderabad State even after he moved from there in 1811. Grindlay explains: "The area seen from the ruined palace was called Begumpura, or the Lady's Quarter, and was named after Aurungzebe's daughter, who was buried there. The cupola and minarets of her tomb are to the centre right."